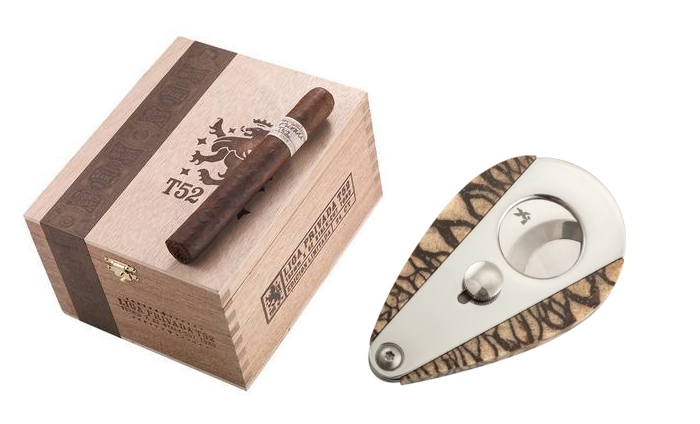 **** Chosen by Winner: Daniel P.
Liga Privada T52 Toro Cigars ($354) are luxurious, full-bodied smokes designed for cigar smokers who appreciate robust, complex cigars. The core is blended with Nicaraguan, Dominican and Honduran long-fillers bound by a zesty Brazilian leaf. But the piece de resistance is the U.S.-grown stalk cut Habano-seed oscuro wrapper. The result is a leaf that's more intense in flavor and richer in oils. The smoke teems with creamy flavors of wood, espresso, peppery spices and sweet tobacco. This XIKAR Xi3 Tiger Coral Cutter ($400) is the ultimate accessory for the distinguished cigar smoker who wants a quality cut and a strikingly beautiful look. XIKAR's iconic teardrop shape cutter has been paired with strikingly beautiful Tiger Coral handles found on the ocean floor. The natural coral handles are crafted by hand and assembled by Scrimshaw Artist, Rick "HutcH" Hutchings. No two are alike. Jerry’s Cigars provides the largest selection of quality premium cigars in Southern Arizona since 2007. With over fifty different brands, and over 70,000 cigars on hand, in the cleanest, most well stocked humidor in town. Features the first and only Xikar cigar lounge, with 12 individual leather chairs and four Big Screen LCD TVs, come by and relax with a great cigar and a great atmosphere.